Facing various legal challenges over the issue of nutrient trading, the Chesapeake Bay Cleanup Plan could wind up back on the drawing board, according to an article by Washington Post reporter Darryl Fears. Similar to the cap and trade program in air pollution control, nutrient trading would allow farms and other enterprises that met or surpassed their pollution-control expectations to sell off their remaining allowances to businesses that fail to meet the set limits. Raising an intramural political fight with other Cleanup Plan supporters, some groups have filed a lawsuit to remove nutrient trading, calling it a “pay to pollute” program to get around the requirements of the Clean Water Act. U.S. District Judge Sylvia H. Rambo is presiding over the case, and she has set no timetable as to when she will make a decision on the plan’s fate. For more information, read the full Washington Post article. To learn more about the lawsuit, as well as other initiatives to restore the health of the Chesapeake Bay, please visit the Chesapeake Bay Foundation’s website. DC Mayor Vincent Gray’s April 2012 Sustainability Vision is moving steadily toward implementation. On November 7, over 100 DC residents met as part of the public outreach process headed by the Department of Environment and the DC Office of Planning. Over the past summer, working groups were formed to discuss topics such as climate, energy, transportation, and a green economy, among others. The working groups identified more than 1,000 possible implementation action items which were submitted to the DC sustainability task force. While sorting through suggestions, the task force focused on jobs, as well as “big impact things that will move the needle.” The Department of Environment and the DC Office of Planning expect to release the final document before the end of the year, and city-wide implementation activities will be launched soon after. For more information, visit the April 2012 Sustainability Vision site. The holiday season is fast approaching; come and learn some gorgeous and eco-friendly gift wrapping techniques from designer Reena Kazmann. Forget the cheap wrapping paper, it just gets thrown away! Through words and pictures, Reena will demonstrate ways to present your gifts inside beautiful, sustainable materials. Visit here for more details. As part of the “What Is It All About?” series presented by Poolesville Green, this educational event will feature discussions of energy options, led by County Councilman Roger Berliner, Poolesville Commissioner Eddie Kuhlman, and Dan Savino of the Poolesville Global Ecology Program. Come learn, socialize, and enjoy refreshments provided by Whole Food Kentlands. Visit here for more details. The event is open to all; please email poolesvillegreen@gmail.com with any questions. While the fervor around Black Friday can make some consider abstaining from holiday shopping altogether, a middle ground exists: local businesses with sustainable practices. This panel will teach attendees both how to find already-green businesses, and how to encourage their favorite stores to adopt sustainable practices. The panel will be moderated by Kurt Walters of CarbonFreeDC, and will feature Live Green President Stephanie Sheridan, Megan Barrett of Clean Currents, and Andy Shallal, owner of Busboys and Poets. For details, please visit CarbonFreeDC’s MeetUp. They were twelve men and women in business attire. The office building had been stripped down to cinder block, steel, concrete and glass. Each donned goggles and gloves, hoisted long-handled mallets, and proceeded to smash the windows in front of them. It was not an act of vandalism or a prank. 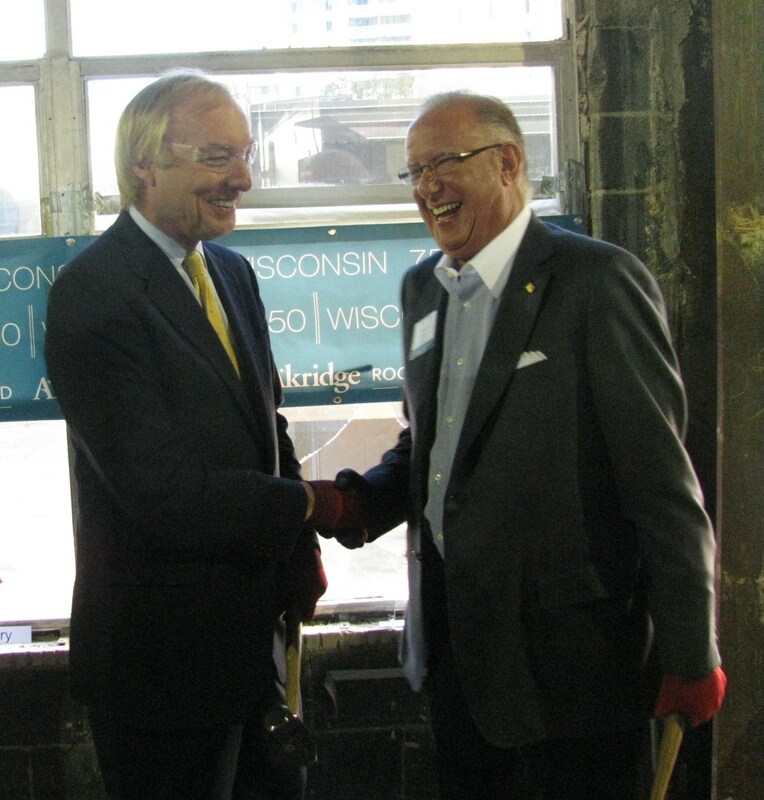 It was a symbolic act of a new beginning for an old building. 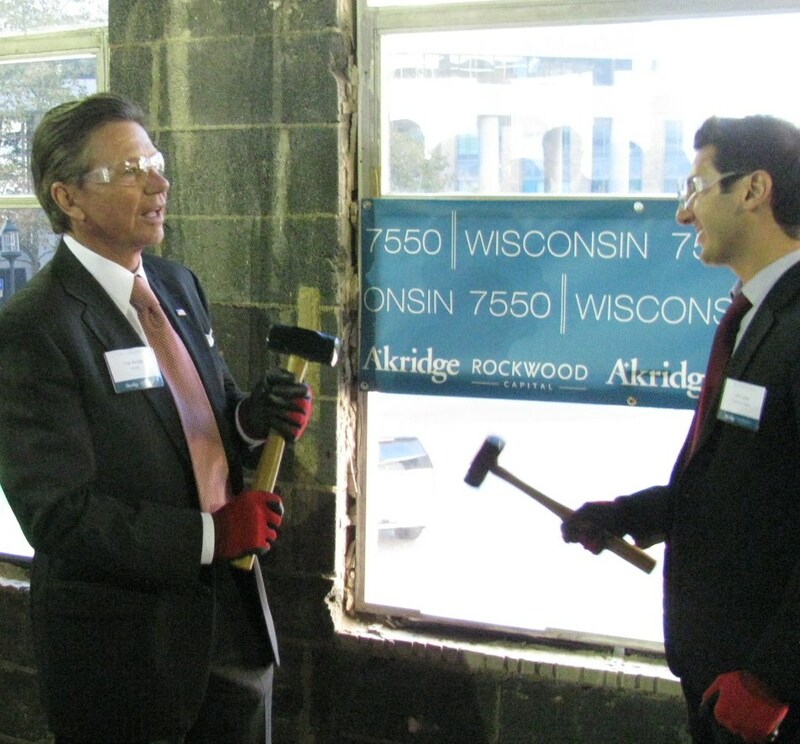 It was a glass breaking ceremony on Tuesday, November 8, at 7550 Wisconsin Avenue in Bethesda. The vacant 120,000 square foot office building at the corner of Wisconsin and Commerce Lane was purchased at GSA auction in 2010 by Washington, DC commercial real estate developer Akridge in partnership with Rockwood Capital, LLC. Reconstruction is underway and expected to be completed by late 2012. New, energy-saving features are expected to earn the building LEED certification. LEED stands for Leadership in Energy and Environmental Design. The certification program was developed by the U.S. Green Building Council (USGBC) in 2000. LEED certification is available for commercial buildings, schools, health care facilities, retailers and homes, whether new, existing or renovated. USGBC examines buildings for energy efficiency, CO2 reduction, indoor environmental quality, water intake, resource depletion, and other environmental factors. Certification is awarded at four levels, Platinum, Gold, Silver, and Certified. Akridge is no stranger to green buildings. 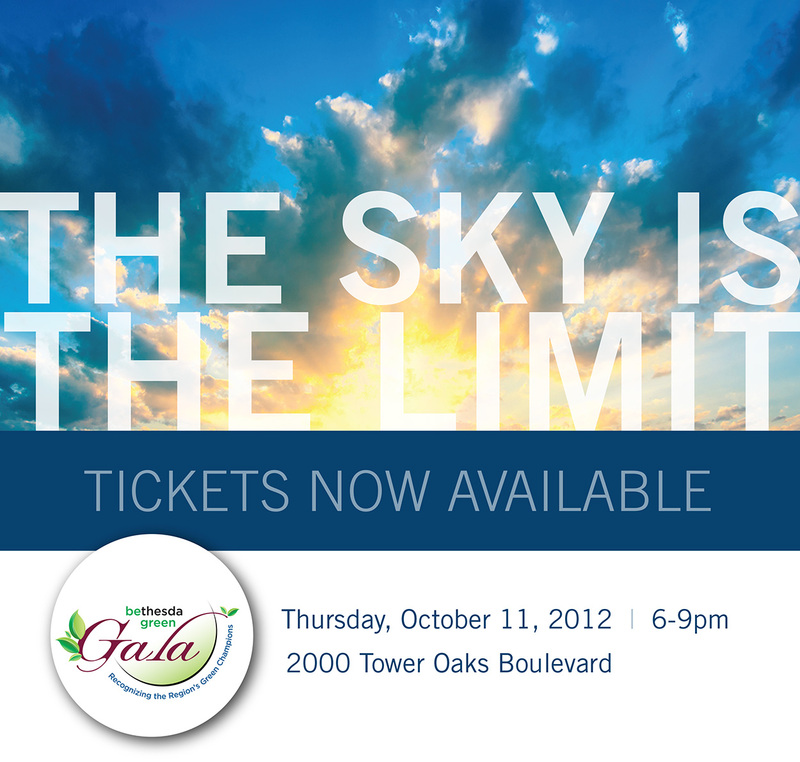 Among its numerous awards, the company received Energy Star Leader “Top Performer” Awards in 2008, 09 and 10. It was named Energy Star Partner of the Year in 2009, the same year that the USGBC National Capital Region honored company founder and chairman, Chip Akridge, as Member of the Year. Dan Rudt is a former radio news anchor and public affairs program host for WPGC-AM, and producer for Westwood One Radio Networks. He is currently a freelance writer/reporter in Montgomery County, MD covering the environmental beat.